3 - 3..........Satan von Ellendonk. 4 - 4..........Gero von Ellendonk. 4 - 4..........Afra von Hohenstaufen. 4 - 4..........Chico von Forell. 5 - 4..........Iris von Ellendonk. Overall Build: Medium-strong male with correct height; thin, soft and short fur, very good colour, good markings; powerful forehead, sufficiently strong lower jaw; dark brown eyes; correct neck length; back long and firm; good chest depth; very good chest width; good rib curvature; good forechest; good angulation; good elbows, strong bone, paws short and closed. Rear feet slightly set outward; well-balanced gait; firm movement; good joints and ligaments. Nature: Naturally calm in the group, open and sure with sound exposure, middle sharpness, very high protective spirit, fighting spirit, courage and hardness. Suitable for improvement of temperament. Pay attention for head type. Bingo von der Weyermühle passed the Körung 'for life' with highest possible ratings for hardness and working drives (very high protection, fighting spirit, courage and hardness with middle sharpness) and lived to 10 years of age. 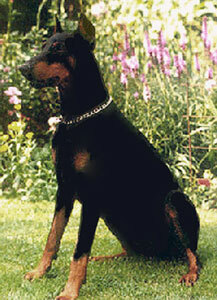 His litter-brother, Boris von der Weyermühle, also passed the Körung 'for life' with highest possible rating for hardness and working drives and lived to 10 years of age. Their sire, Akim von Vaciweba, passed the Körung 'for life' with highest rating for hardness and working drives. Alfa: SchH 3, FH, D.V. Meisterschaft multi-participant and passed the Körung 'for life' with highest possible ratings for working drives, hardness and V rating. She is dam of the von Warringhof “D, F, H, J, L” litters (Janka, Hel). Aisha: SchH 3 and passed the Körung 'for life' with highest possible ratings for working drives, hardness and V 1A rating. Cocoa: SchH 1 and passed the ZTP with highest possible rating for protection, courage, fighting drive, self-assuredness, high hardness and V 1A rating. She is dam of the vom Blitzkrieger “A, B” litters (Allee, Aisin, Baron, Bogart, Bo, Bren).